The city of Philadelphia was basically on suicide watch after the loss to Dallas, with the only energy wielded by people forming lynch mobs for Chip Kelly. Much of the pessimism was realistic, too. The Eagles’ offense was easily the worst in the NFL, as their three running backs combined for negative yardage against the Cowboys’ decimated defense. Kelly was running a drastically pruned set of plays, and Dallas defenders were yelling out the play call pre-snap just by looking at the formation. 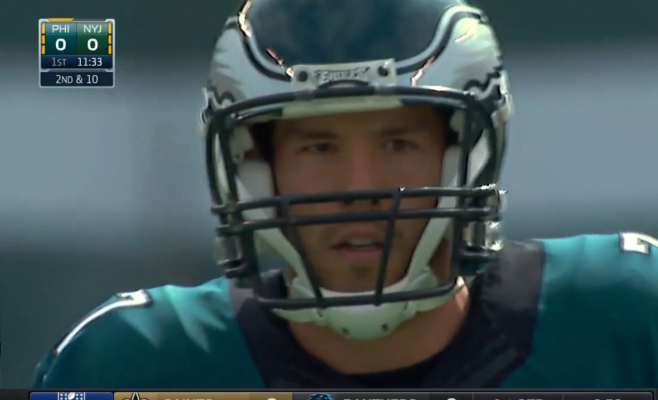 QB Sam Bradford looked deeply rattled at best, Jordan Matthews was the only receiver who could catch a ball, and the team was ripped apart by injuries — including top RB DeMarco Murray and both starting ILBs. 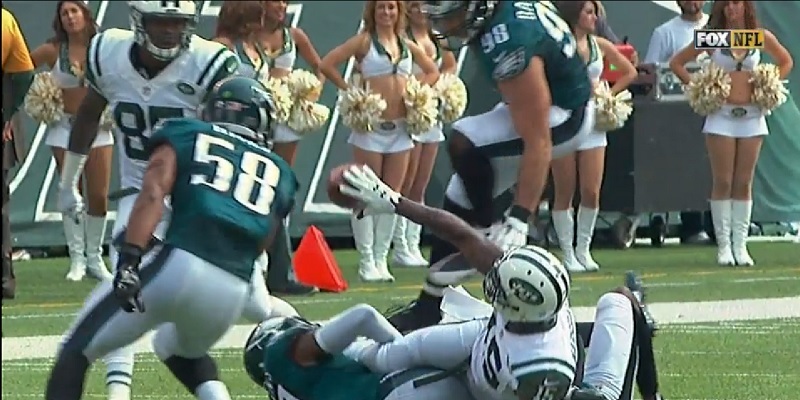 Even worse, the next opponent was the New York Jets, 2-0 under new coach (and defensive mastermind) Todd Bowles. It was not going to get any easier to gain yards. This was a serious test of character for the coach and the team. Team and coach both passed the test, in part because Philadelphia’s defense has quietly gotten pretty excellent too. It ranks No. 1 in the NFL on yards allowed per run, at 3.14, and against New York the pass defense — with 6 new DBs and a new position coach after two years as the worst in the league — started showing results from all the changes. Brandon Bair tips pass, later intercepted. The team intercepted cagey game-manager Ryan Fitzpatrick three times, with two ex-Ducks and a rookie leading the charge. Walter Thurmond, who had never played safety before coming to the Eagles’ training camp this summer, picked off his second pass this year, finishing with some nifty footwork on the sideline to make sure it was a legal reception. And the star of the game was rookie Jordan Hicks, an inside linebacker chosen in the 3rd round. Injuries to Kiko Alonso and Mychal Kendricks forced him into his first start at age 23, and he did a lot more than just fill in with 10 tackles (nine solo), a pass breakup and an interception on one of Bair’s tips. How (and when) not to lateral. 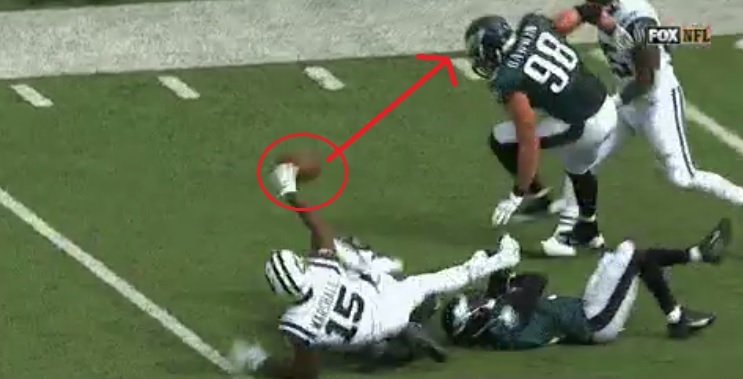 The ball hit the face mask of OLB Connor Barwin, who headed the ball to Hicks. The rookie scooped it up and added a tasty 11-yard return down to the New York 36. Seven plays later, Darren Sproles — who had already run a punt back 89 yards for a score — ran in a one-yard touchdown and the Eagles led, 24-0. As fun as all that was, it turned out to be the high point of the game — with another half to play. The Jets came back steadily as the Eagles’ “four-minute offense” sputtered and the New York defense locked down. 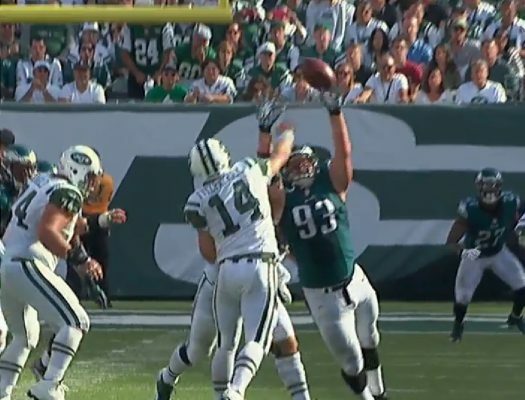 The final was 24-17, and the Birds needed those three interceptions — all in the second half — to hold off the Jets. Remember all those problems with the offense? Bradford’s shakiness and the inability of any WR not named Jordan Matthews to catch a pass did not change. Chip Kelly opened up his playbook with snaps under center, unbalanced lines and some outside zone, as well as some nice mixed tempo — slow, fast, slow — which caught the Jets off-guard on that last scoring drive. Courageously, Parkey finished the game and made his one short field goal attempt. The groin has been a problem for Parkey since last December, when he missed two FGs in a three-point loss to Washington. Though the team denied there was any problem, it looked like Parkey was having trouble all off-season with his groin, missing FGs and an extra point while struggling to reach the end zone on kickoffs. Now, the Eagles have placed him on season-ending IR and signed Caleb Sturgis, a third-year kicker who has a powerful leg but is only 20-33 on kicks over 40 yards. With a strong D and a shaky kicker, we may see the reappearance of Big Balls Chip, who in my opinion was so aggressive at Oregon largely because he never had a decent kicker. The team got some good injury news Wednesday. Alonso missed the game with a knee injury reported to be a partial tear of his recently repaired ACL, but a second opinion found the ligament to be intact. He could be back in four weeks. Amazingly, after all the struggles, the Eagles are in the thick of the playoff race, since they are in the miserable NFCE. They’re tied at 1-2 with Washington (who they play Sunday in possible hurricane conditions) and the New York Giants. All three trail the Cowboys by a game, but Dallas — without Tony Romo, Dez Bryant and several key defenders — threw away two 14-point leads to lose to Atlanta. They’re vulnerable at best.